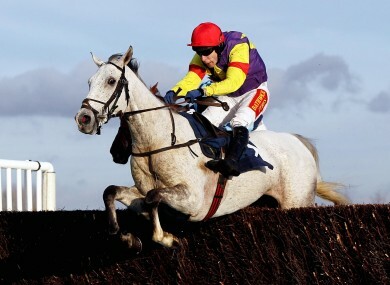 Last year’s World Hurdle runner-up Grands Crus has been installed as 13/8 favourite for Wednesday’s RSA Chase. Tom Scudamore on board Grands Crus. GRANDS CRUS WILL not challenge Long Run and the fit-again Kauto Star in Friday’s Cheltenham Gold Cup, with trainer David Pipe confirming that he is to take his chance in the RSA Chase instead. The seven-year-old impressed with three wins from three starts as a novice chaser this season and was considered a contender in this year’s relatively open Gold Cup field. Wednesday’s RSA Chase was always considered as Grands Crus’ most realistic alternative, and Pipe said last week that he and the horse’s connections would wait for news on Kauto Star’s recovery before making a final decision. Kauto was passed fit this morning after making a full recovery from a recent fall on the gallops, but Pipe feels that his rising star could have made life tough for the Gold Cup’s main players. “It has been a difficult decision to make. Such is the impression that he has created in his three starts since turning to fences, he most certainly would not have been out of place in the Gold Cup line-up regardless of whether Kauto Star participates or not. That doesn’t mean that we consider the RSA to be a “penalty kick” – all races at the Festival are fiercely competitive and difficult to win, but at this stage in his career (remember, he has only had fourteen starts in his life) we felt that the best option for the horse was to keep him with novices’ for the time being. I dare say that I won’t be getting much sleep between now and then, but at least I won’t have to keep listening to people asking me ‘which race?’ anymore! Bookmakers immediately cut Grands Crus’ odds in the RSA to 13/8, with Bob’s Worth second favourite at 10/3. Email “Pipe dream: Grands Crus skips Gold Cup in favour of RSA”. Feedback on “Pipe dream: Grands Crus skips Gold Cup in favour of RSA”.